"I couldn't believe all the heavenly tastes and textures in this dish when I first tried it. It takes a bit of work but definitely worth the effort!" Mix together flour, sugar, baking powder and salt. Cut in shortening until mixture resembles coarse crumbs. Add water, egg, and vinegar. Mix together but do not work too much. Divide pastry into two pieces, cover and chill for 30 minutes. Preheat oven to 350 degrees F (175 degrees C). Form each piece into a round and roll out crust on lightly floured surface. Carefully fit into two 10 inch tart pans. Blind bake tart shells in preheated oven until golden brown. Let cool. Saute onion in butter until translucent. Divide ham, bacon and onion into two equal portions and sprinkle over the bottom of tart shells. Whisk together cream and beaten eggs. Add salt, pepper, nutmeg, basil, and thyme, and stir well. Pour egg mixture over bacon mixture. Sprinkle cream cheese cubes and grated Cheddar and Monterey Jack cheeses over the top of each filled tart. 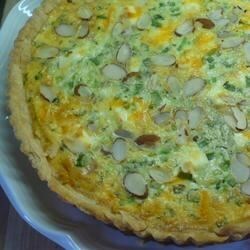 Sprinkle green onions over cheese, followed by sliced almonds. Bake in preheated 350 degrees F (175 degrees C) oven for 30 to 40 minutes. Let cool slightly, then cut and serve. This was a delicious addition to a small brunch! I used 2 frozen Marie Calendars pie shells (to save time) and reduced the amount of cheese by half, and it was GREAT! This is a great recipe. The dough for the crust was a little wet, but working in a little extra flour made it easy to work with and it was delicious. Will definitely be making this one again! The KING of breadfast tarts!